Any day or time is a great time for a dinosaur program. While I love doing them for any age, I especially enjoy doing these programs for school agers - the non-fiction elements are just too good to pass up and it's a wonderful STEM opportunity. This Caldecott honor is great to book talk. Two hundred years ago, people hadn't the slightest idea on what dinosaurs looked like. 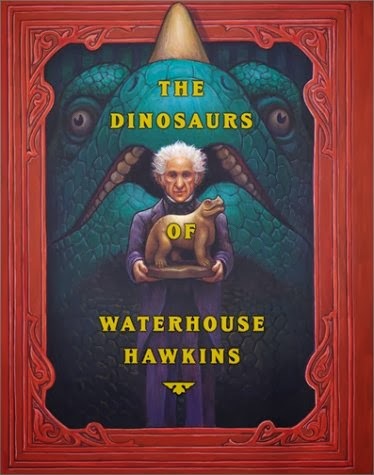 English artist Hawkins studied the bone fragments and structures and used his own knowledge of animals to build life size models of what dinosaurs looked like. He held a dinner party in a hollowed out dinosaur to create excitiement and eventually created a huge garden to display the behemoths to the public. 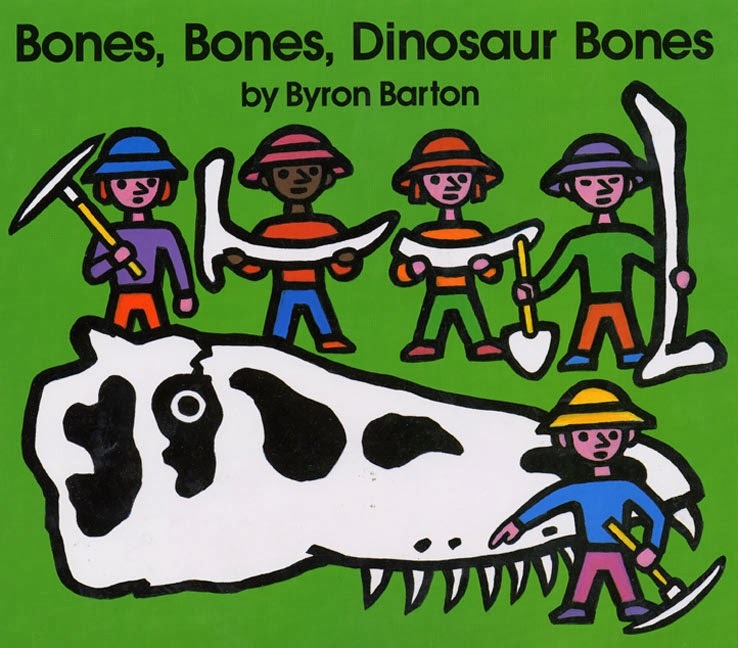 This is a great short picture book on archaeology and fossil hunting. Activity: Have kids glue dry penne pasta (bones) onto a dinosaur outline. Doing it early in the program gives the glue plenty of time to dry. It also gives us a chance to talk about how hard it was for scientists to figure out exactly how all the fragments theyuncovered fit together. Imagine putting a dinosaur skeleton together without an outline. What bone connects to what bone?!?! 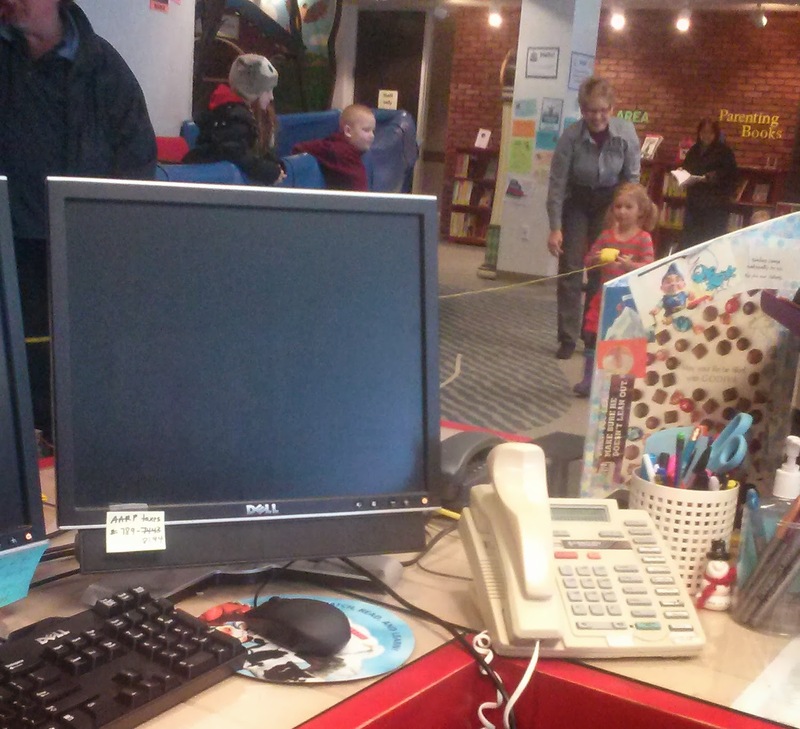 Thanks to Sunflower Storytime for this much used idea here at LPL! Read either of these books that examine and compare the size of dinosaurs. Activitiy: Have a ball of string or yarn 130 feet long (don't tell the kids how long). Tie it at one end of the room and have kids take turns unrolling it as you "measure a dinosaur. This was the size of a diplodocus. Lots of ooohs and aaahs along the way. Then bring the kids and string back and have them measure how long the string is with yard stick and tape measure. Talk about what else they think might be that long around the community. Activity: As the final ending activity, I cannot resist asking kids to be fossil hunters. We talk about the painstaking careful excavation of fossils and dinosaur bones with small picks, trowels and even brushes to carefully reveal small fragments. Everyone receives a chocolate chip cookie and a toothpick. We ask each child to carefully excavate one chocolate chip from the cookie with the toothpick - and then gobble up the results. With lots of non fiction books on display ready for check-out this is a sure fire hit and an easy way to do science with fierce fans of dinaosaurs! * a huge tip of the hat and genuflecting reverence to Sandy Berman who back in the day fought mightily - and often successfully- to push LC subject headings from the academically bizarre to the practical, useful and reality-reflecting modern day. As a young librarian, there WAS no such thing as a subject heading called "Dinosaurs". No my friends, it was really, really truly "Dinosauria". Here's to Sandy and his amazing leadership that still stands us in good stead.